© Estate of the Artist. Photograph by R. H. Hensleigh and Tim Thayer. Gift of S. C. Johnson and Son, Inc.
As a young painter Wharton Esherick lived and taught in the utopian community of Fairhope, Alabama, prior to settling in 1926 in Paoli, Pennsylvania, outside his native city of Philadelphia. Inspired by Thoreau’s Walden, Esherick and his wife embraced a life there in harmony with nature, absent the modern conveniences that were shaping the typical twentieth-century home. His attention turned from painting to woodcarving as he crafted a unique house and studio complete with furnishings and architectural details of his own design. Although this woodland dwelling was the focus of his creative energy for decades, the reclusive artist also crafted sculpture and furniture for select clients. Like his house, Esherick’s furniture reflects the organic forms and materials of the natural environment. 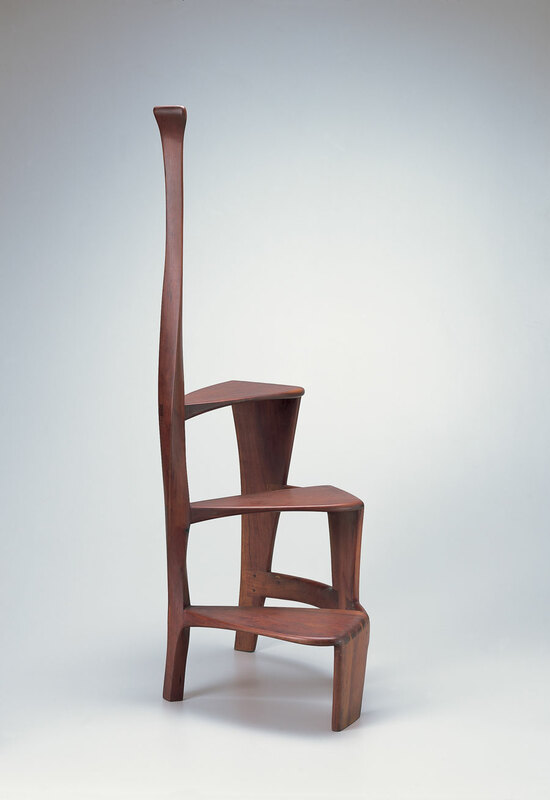 In functional artworks such as his graceful Spiral Three-Step Ladder, Esherick combines a devotion to craftsmanship inherited from the Arts and Crafts tradition with a thoroughly modern design aesthetic. His singular accomplishments earned him the honor of “Dean of American Craftsmen” to a succeeding generation and helped to inspire a revival in fine craft in the 1960s.